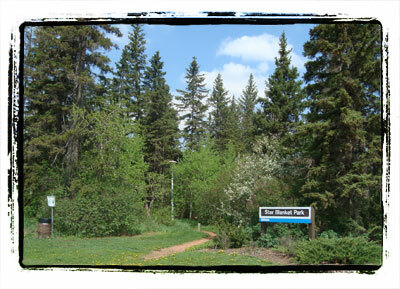 This interesting treestand in the Bisset neighbourhood of Mill Woods is a remnant of a coniferous-dominated mixed-wood forest. Among the old growth white spruce trees there are some open patches that allow the sunlight to penetrate. In these areas the shrubs have responded by growing tall and healthy. Within the natural area it is possible to find animals that are typical of spruce forests such as squirrels, nuthatches, and many other bird species. Occasionally, raptors can be seen perched in the high branches of the tall spruce trees. 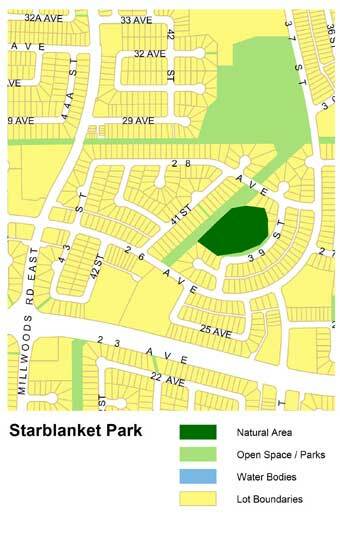 Starblanket Park is located at 2712 39 Street and can be accessed both from the local roads along its southern and eastern sides and by using the pipeline Right-of-Way that abuts its north-western edge. A lighted mulch pathway extends through the interior of the stand from east to west and parking is available along local roadways. The Starblanket natural area provides an excellent opportunity to view a variety of bird and small mammal species associated with spruce-dominated forests. A diverse assemblage of shrub and herb species also flourishes at this site.